This peaceful, bamboo-eating member of the bear family faces a number of threats. Its forest habitat is fragmented and populations are small and isolated from each other. Meanwhile, poaching remains an ever-present threat. By mid-2005, the Chinese government had established over 50 panda reserves, protecting more than 10,400km² and over 45% of remaining giant panda habitat. However, habitat destruction continues to pose a threat to the many pandas living outside these areas. Currently, only around 61% of the population, or about 980 pandas, are under protection in reserves. As China’s economy continues its rapid development, it is more important than ever to ensure the giant panda’s survival. 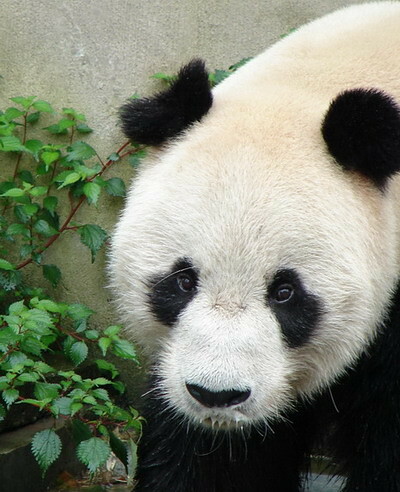 WWF has been active in giant panda conservation since 1980. More recently, WWF has been helping the government of China to undertake its National Conservation Programme for the giant panda and its habitat. This programme has made significant progress: Reserves for this species cover more than 16,000 km² of forest in and around their habitat. A survey (released in 2004) revealed that an estimated 1,600 individuals remain in the wild. The panda named after hope, Pan Pan! In the mid-1980s, arrow bamboo, one of the giant panda’s staple foods, died off extensively in the Sichuan, Gansu,and Shaanxi provinces. The lack of food in this prime panda habitat reached such an extreme level that local governments organized panda rescue teams to rescue starving or sick pandas. In the mountains of Baoxing county, on June 7, 1986, rescuers found an abandoned panda cub in the wild. They named the cub “Pan Pan”, which means “hope” – they hoped he would grow up healthily. 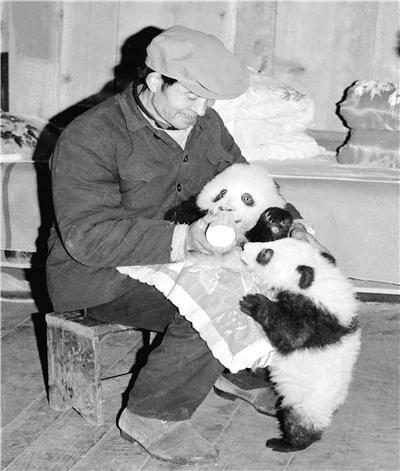 The cub was taken in by Li Wuke (pictured below), who had much experience in taking care of pandas and who was already caring for another small cub. Li recalls, “Pan Pan was brought here that winter, only two months old. He lost his mother, looking spiritless, with discharge from the eyes, and his fur was yellowish. I wiped his eyes with a wet handkerchief — if his mother had been with him, she would have licked his eyes clean. At that time, I was taking care of another cub An An. And then both cubs lived in my small room with me”.The boys, loved wrestling with each other. Pan Pan, who was a little older than An An, was a bit of a bully. He would chase An An, rolling and wrestling with him around the room. Both were young; their teeth and claws couldn’t hurt each other. The cubs slept with Li at night, At night, on his single bed. Li in the middle, and and a panda at either side.They grew fast! One year passed, and they grew to about 35 kg. In 1990 An An went to Singapore, attracting hundreds of thousands visitors, and Pan Pan went to Wolong.In 1987, Pan Pan starred in a movie called “Panda Story”. At that time he weighed over 50 kg, with glossy black and white fur. He was cute and very photogenic. Pan Pan will be 28 years old this year. Considered to be the most prolific panda daddy, Pan Pan is the father of 32 offspring – 16 of whom are still alive. Pan Pan’s oldest living child is female Bai Yun of the San Diego Zoo who was born in 1991; his youngest child is female Xin Yue who lives at the zoo in Suzhou; she was born in 2003. He has offspring living all over the world including male Tian Tian of the National Zoo, female Lin Hui of the Chiang Mai Zoo, and Yang Guang of the Edinburgh Zoo. His granddaughters include Yang Yang of the Schonbrunn Zoo, Fu Ni of the Adelaide Zoo, and Ying Ying of Ocean Park Hong Kong. Pan Pan currently lives a peaceful and comfortable life at a tea resort in Emeishan along with females Bai Xue and Ping Ping. (A sincere Thank you to Charlene Johnson for this great compilation of information).